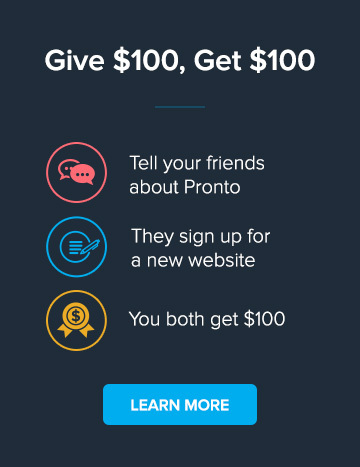 Here at Pronto Marketing, our website platform is at the core of our efforts to help small businesses succeed online. Powered by WordPress and built from the ground up with small businesses in mind, it has helped us create and maintain over 1,000 websites, helping small businesses establish their online presence, streamline their sales cycle, generate leads and more. We call this amazing website platform Phoenix, and we wanted to take some time to take a deeper look at some of it's powerful features. Using Phoenix allows us to handcraft each website we make by using sets of custom shortcodes that define style and layout. This allows for truly dynamic and custom designs and unlimited design possibilities. If there’s something out there you like – Phoenix can probably do it. Whether you are currently a customer of Pronto Marketing or are looking to set up your new website, we think this in-depth look at Phoenix's features will help you understand the amazing opportunities and help give you ideas as you think about expanding your current Pronto website, adding to or editing your current Pronto website, or when thinking about setting up an entirely new website. We struggled for years trying our home grown WordPress site. It was cluttered and did not project a professional image. Making the leap of faith to engage Pronto over 2 years ago has been the single most important marketing investment we have ever made. A mobile ready responsive website was high on our list for our refresh. We’re very pleased with the the results you delivered, our site looks great. We couldn’t be more pleased with our new website. The design is fresh and effective at telling our story. Thanks Pronto! So let's dive in and find out what Phoenix can do for your business!